Located in Brampton Ontario... but serving the world! Industry-leading climate and inventory controls. Reliable product packing & shipping... to anywhere! 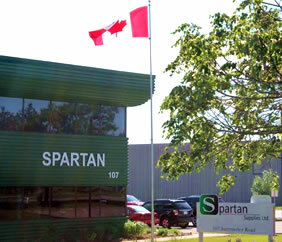 Spartan Supplies Ltd. is recognized across the GTA and North America for its reliable and simplified approach to receiving, warehousing, and packing of third party products. With years of experience and existing systems in place, the staff at Spartan Supplies Ltd. can meet the needs of clients big or small. The company warehouse and business headquarters is strategically located at the hub of Ontario’s major transportation routes, for quick drop-off and loading. Spartan offers both short and long term storage. Bulk and rack storage positions, as well as calibrated temperature controlled cold and incubation areas to meet specialized needs . We are Kosher and Halal capable. We offer a standard 24 hour turn around from order receipt to pick, pack and shipped. We also are able to accommodate immediate or rush orders. We understand the importance of maintaining accurate inventory reports and are committed to providing this information to our customers. Visit our world-class storage and Warehousing Space. Learn more about our shipping, packing and storing services. Get to know our skilled and committed staff and management.